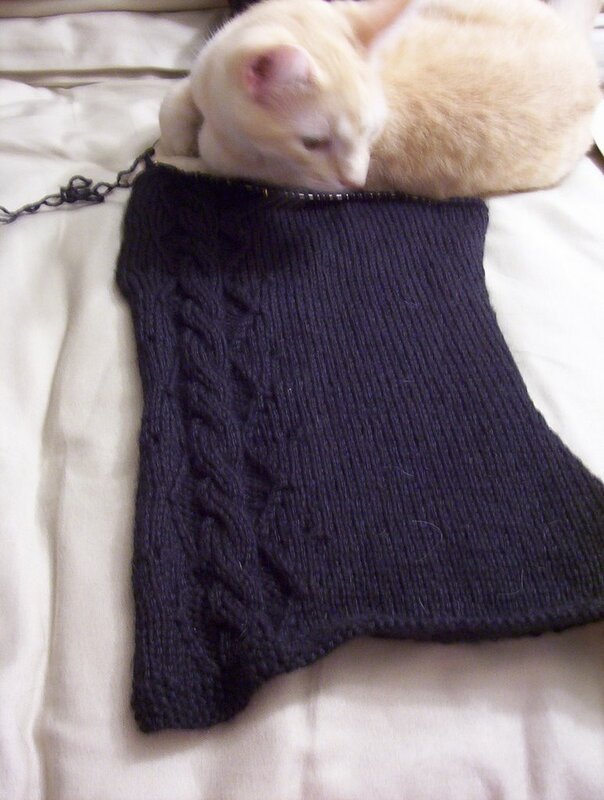 Here's the latest on my Eris cardigan. I worked on it for a couple of hours this past Tuesday when I was over at the Laundromat. That's really my best knitting time. No one is ever there, so I just sit around with my headphones on and knit. Best of all, I don't feel like I'm wasting time, because I can't really do much else during that time anyway! The color's acutally not too bad in this photo, except that it's a little darker in person. Sorry about the bad pun, but I'm excited about this idea I just had. I have a ball winder, but no swift, so winding balls has been a long, slow process with hanks carefully draped around the back of my chair. I've thought about buying a swift, but they're expensive and I don't know where I'd keep it. 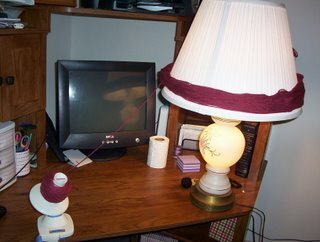 But tonight, I realized that the shade on the lamp on my desk is REALLY big--big enough to hold a hank of Cascade 220! So I loosened the top screw, placed my hank on the shade, and voila! A ball of wool wound within a matter of one or two minutes, rather than forty-five! I'm having issues with my computer and Mozilla Firefox, sorry that I haven't posted in a while. And I can't get Blogger to upload photos no matter which browser I use. GRR! But I've been busy! As if I really needed another project on the needles, but I just couldn't wait to get started: An Eris cardigan. 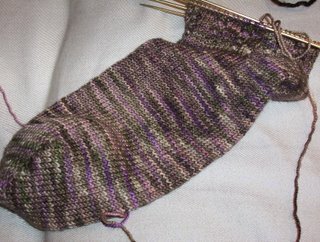 I expropriated the needles from the Bristow cardigan once I finished the Front Left piece I'd been working on and will be using them for Eris. I really ought to finish Bristow first, but oh, well! I've completed the collar and am now working on the yoke. The cardigan is made from Cascade 220, color #2412 , kind of a berry color. I also have a new toy. I've always loved school supplies: folders, notebooks, pens, paper, stickers, binders, etc. A few years ago, my brother came out to make a campus visit to the school I was attending, and we went to the museum of art and looked around for a while. Then we went to the museum gift shop, and saw these dip pens made out of glass. They were so pretty and we both really liked them. We almost bought them, but it wasn't practical at the time. Last week, I saw a set on sale for pretty cheap elsewhere, and so I snatched it up! Is up and posted there to the right!